This is the second in a series of articles describing 10 ways teachers at White Bear Lake High School — South Campus and the school library are working together to enhance learning in hybrid classes. (The first installment is available here.) Hybrid courses can provide new, exciting and effective learning experiences. They also provide flexibility in terms of time and place of study. We have hundreds of students visiting the school library each week who benefit from the resources and the help of our staff. One of the first things we did was develop a hybrid course website and hybrid orientation video. The Hybrid Helper website is designed to be a "one stop shop" for students to assess their readiness for hybrid classes along with information and links to develop their independent study skills. Here is a brief description of each of the Hybrid Helpers sections. 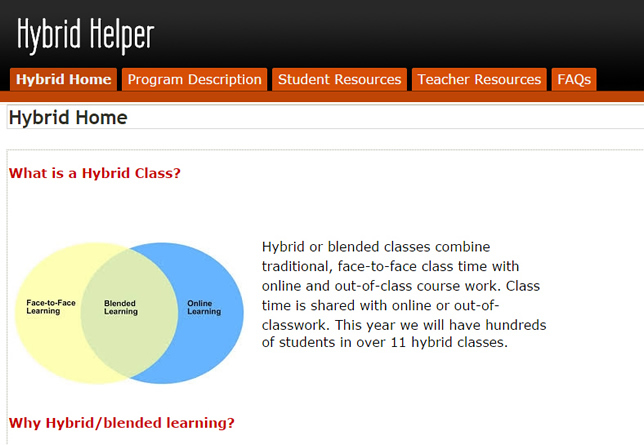 White Bear Lake High School's Hybrid Helper site is designed to be a "one stop shop" for students to assess their readiness for hybrid classes along with information and links to develop their independent study skills. This section includes a definition of hybrid learning with a description of how hybrid learning was started and its current and future growth. For example, a 2011 Pew survey found that approximately 77 percent of the nation's higher education institutions offered online courses. Also provided are links to several self-assessments to help students decide if they are ready to take a hybrid class. Finally, four essential questions used by the University of Wisconsin, Milwaukee are posted to help students determine their chances of success in a hybrid class. This section provides an overview of White Bear Lake Area High School's commitment to providing hybrid learning experiences for students. In addition, student expectations are described in detail. Emphasis is placed on making sure students know they will need to work as hard in this course as they would in a traditional face-to-face course. Among the expectations are: checking Schoology, the learning management system (LMS), often before class meetings, scheduling regular times for online activities, being an active participant and completing all readings and activities on time. From reading The Checklist Manifesto: How to Get Things Right, we included student and teacher checklists to make sure essential procedures are completed. Adding student checklists helps prevent missing assignments and activities and promotes effective communication. Among the checklist items are: contact and course information, communication methods, policies, assignments, grading and technical and Schoology requirements. This section provides an overview of active listening techniques such as being non-judgmental, giving undivided attention and using silence effectively. Also included is a description of the seven norms of collaboration from The Center on Education covering topics like: posing questions and putting ideas on the table. There are tips regarding online etiquette or "netiquette" for interaction with other students and teachers online. For instance, spell checking and considering tone before posting. This part of the site provides a wide range of hybrid development checklists from University of Central Florida's Blended Learning Toolkit to Edsurge's Blended Learning Checklist. Also included in teacher resources are quick links to additional information, the district Tech Tips blog, Rachael Juliano's Best Practices Guide, the University of Vermont Center for Teaching & Learning and UNLV Online Education. How do I know if I am likely to be successful in a hybrid course? How often will hybrid courses meet? What will be my time commitment outside of school? Can I come to class on a hybrid day? Will there be opportunities for social interaction in hybrid course? Explain the hybrid course format, meeting schedule and assignments. Make sure that students understand the workload expectations in both environments. Highlight any technical needs or particular assignments that may require additional resources. Clearly state in the syllabus all of the information students will need to know about both delivery media. Make all assignments and other course expectations as explicit as possible right from the start. Clearly present the schedule of in-class and online work, with due dates stated explicitly and repeatedly. Intentional redundancy is necessary in hybrid and online courses. A 2008 study by Paula Jones, Kim Naugle, and MaryAnn Kolloff evaluated student perceptions related to the significance of using a video to introduce the instructor to students in both a fully online course and a hybrid course. From the results of this study, they concluded that introductory videos can help to establish the instructor's teaching presence with the students, regardless of the method of delivery of the course. Finally, in their June 11, 2014 article in THE Journal, Emmett Dulaney and Tim States support developing video orientations for online and hybrid courses. "Studies point to an introductory course video from the instructor welcoming students as being able to cause shifts in course evaluations and discussion postings. For that reason, instructors should consider creating short videos greeting the students and posting them as the first item seen when enrolling in a Moodle course." At this time we have a video orientation produced by students who have completed several hybrid courses. Several hybrid teachers are currently making video introductions to their hybrid classes to personalize their online presence and provide a way for students to review their roles and responsibilities.